Life for the cataract patient has greatly improved since the introduction of Multi-Focal Implants. These advanced intraocular lenses (multi-IOL) function just like the eye’s natural lens, allowing patients to enjoy excellent distance and near vision without the need for spectacles. The conventional technology, a mono-focal implant, whilst very good, has limitations. 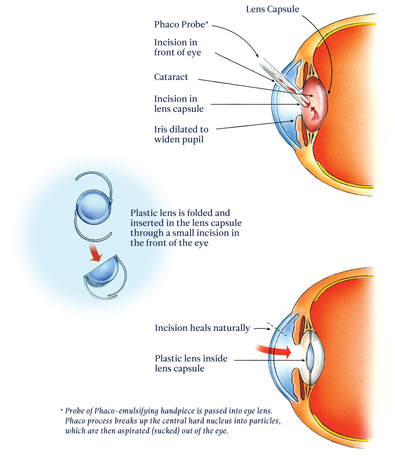 In general a cataract patient is corrected for either distance or near vision so obliging him or her to use glasses for reading (usually) or distance vision. By contrast, the Multi-Focal Implant lens allows patients to see clearly both for distance and near without glasses in more than eight out of ten cases. It has tiny concentric rings of differing powers that allow simultaneous focus of distance and near with some intermediate function. Professor Christopher Bentley uses two kinds of Multi-Focal Implant: ReZoom™ from Advanced Medical Optics (AMO) and ReSTOR from Alcon. ReZoom™ Multifocal IOL provides sharp distance and near vision in all light conditions for all lifestyles. The lens has three distinct distance-dominant zones providing good distance vision in bright, intermediate, and low light conditions. It is equally effective in providing crisp near vision at any time. ReSTOR intraocular lens (IOL) has a gradual tapering of the diffractive steps from the center to the outside edge of the lens. This creates a smooth transition of light between the distance, intermediate and near focal points. A series of tiny steps within the centre of the lens work together, allowing the post-cataract patient to enjoy optimal near-through-distance vision. Professor Bentley routinely looks to control Astigmatism, a condition of the human eye that causes either blurred vision or a sense that each eye is seeing objects slightly differently. Astigmatism can affect the outcome of cataract surgery in terms of spectacle independence, so this will be assessed prior to any operation. Multi Focal Implants can also correct Presbyopia, a condition associated with ageing, whereby the natural crystalline lens of the eye progressively loses its ability to focus. People with Presbyopia have increasing difficulty in seeing objects close-up. Note: Professor Bentley has no financial interest in either Alcon or AMO.